As the race went green Higgs was the immediate leader with Chris Dymock coming from position fourand going three wide around Mark House and Todd Broadwood to grab second. Broadwood and House were side by side for third, but up front Higgs was pulling away from the rest of the field. Dymock slowly closed the gap over the early laps, but Higgs seemed to find a second wind on about lap six when he set the fastest lap of the race to that point and pulled away once again as Dymock chased while Broadwood got the better of House in third. Lapped traffic came into play on lap nine, but Higgs simply moved to the highline and drove straight around, again extending his lead. Higgs lowered the fastest lap for the race again on lap twelve, and with amargin over two and a half seconds with three to go, he looked simply unbeatable. 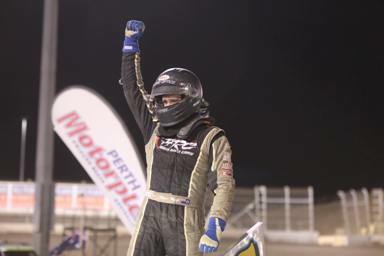 Higgs would go on and grab his second career Perth Motorplex feature win, and his third for the season. 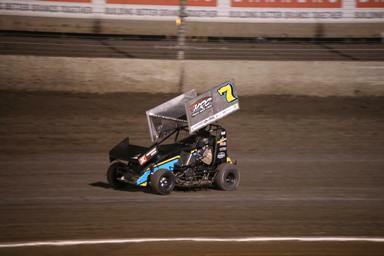 Courtesy of the nights results Cameron Mckenzie also did enough to secure his first Perth Motorplex Track Championship, scoring a total of 1100 points to finish nineteen markers clear of Chris Dymock, while younger brother JyeMckenzie was third place another twenty seven points further back. 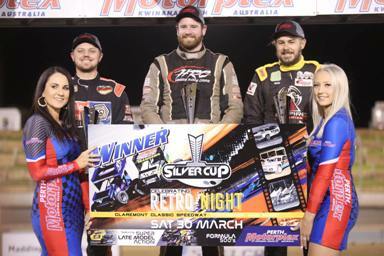 This brings to a close the Perth Motorplex season for the Formula 500;s, but the final show for season 2018/19 for the Formula 500’s will be the final round of the West Coast Series, to be held at Pithara Speedway on the 13th of April. Heat One, 8 laps: 1. Ryan Higgs, 2. Chris Dymock, 3. Todd Broadwood, 4. Cameron Mckenzie, 5. Luke Nardini, 6. Mark House, 7. JyeMckenzie, 8. Greg Edwards, 9. Amy Waldron. Total Time: 2.12.802. Winning Margin: 3.820. Fastest Lap: 16.491 Ryan Higgs. Heat Two, 8 laps: 1. Cameron Mckenzie, 2. Todd Broadwood, 3. Ryan Higgs, 4. Mark House, 5. Chris Dymock, 6. Luke Nardini, 7. JyeMckenzie, 8. Greg Edwards, 9. Amy Waldron. Total Time: 2.15.268. Winning Margin: 3.775. Fastest Lap: 16.769 Cameron Mckenzie. Feature, 15 laps: 1. Ryan Higgs, 2. Chris Dymock, 3. Todd Broadwood, 4. Mark House, 5. Cameron Mckenzie, 6. Luke Nardini, 7. Greg Edwards, 8. JyeMckenzie, 9. Amy Waldron. Total Time: 4.15.820. Winning Margin: 2.982. Fastest Lap: 16.661 Ryan Higgs.